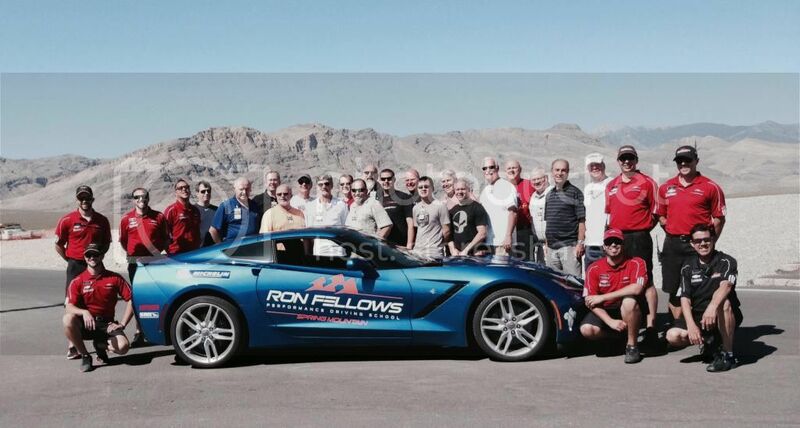 Once you have attended Ron Fellows Stingray Performance Driving School, please post your impressions for example, about how, if at all, the experience impacts your thinking and driving of your Stingray? Feel free to also include any hints you think future owners might find of value when they attend the school. It would also be useful to share whether this is your first formal performance driving school. Thanks! [email protected], jimp94605 and Esquire like this. We just returned from the two day school on May 28th and 29th. Earlier this year I had read on the Forums about the special offer for new C7 Corvette Owners. While I've had track experience at Lime Rock and Watkins Glen I had never attended a formal school and this offer was just too good to pass up. With Chevrolet covering 60% of the cost the savings paid for our flights and three night condo stay. We had two primary objectives in mind: first, to learn everything about the capabilities of the C7 and, second, to learn current driving techniques from a formal driving school. In both respects our expectations were exceeded. The driving school was extremely well done. Just the right balance of classroom, exercises and plenty of on-track driving. The school begins at 8am and ends around 4:30 each day. The instructors were all superb. Maybe the most impressive part of the instruction was that they kept control of their cars while looking out their rear-view mirrors to give you instruction on the correct entry, braking and shifting points all while speaking to you on their in-car radio's. My wife, Barb, attended all the classes and also rode with one instructor so she got to experience most everything in person. Riding with the instructor is open to anyone accompanying you who wants to experience the track. The school Director is really energetic and enthusiastic and that followed to all the instructors. There were thirteen drivers in our group and everyone was really friendly and all there for the same reasons - especially to have fun. Everyone came away with a great experience and had nothing but good things to say about every facet of the school and the facility. The first day was a mix of classroom instruction on braking, cornering, understanding under-steer and over-steer, hitting the apex's correctly, exit speed and quite a bit of time on heel and toeing. We also did wet skid pad runs along with full force braking to give us a feel of the car at its limits. After each classroom session it was onto the track for practical experience and a debrief afterwards. We did several heel and toeing practice sessions even though the C7 has the Rev Match - which works great by the way. In the afternoon of the first day we had group sessions of three to four cars on the track following one of the instructors. Each driver rotated their position to be directly behind the instructor so he could give you tips on the correct line, when to brake, when to downshift, what to look for on the apex and when to "balance" the car entering a turn as well as when to accelerate out of the turn. Their emphasis is on exit speed and not barreling into the corners. The second day was spent with many on-track sessions. They moved the drivers into smaller groups depending on your lap speeds which provided more laps at greater speeds. Interestingly, the instructors used Camaro's for most of the early sessions (I believe because of better rear visibility) but for the last two sessions our instructor used a Vette so we could really get going. Those sessions were the most fun! They have several track configurations and we used the 1.5 mile track which was designed for the driving school with plenty of variations of left and right turns, some slightly banked turns, decreasing radius turns, tight 180 degree turns, one small downhill section and two straights. The C7 is really impressive as a track car: great engine torque, extremely well balanced, great brakes, unreal cornering capability and fast. All of the cars used are C7 Z51's with the 7 speed transmission although they have just ordered ten C7's with automatic transmissions if you want to use those. I was impressed by how hard the cars could be run with not a single car having any issues. If these things can be flogged as hard as we were using them they should really hold up well in regular street driving. We made every run with the A/C on which was nice to keep things cool even in those cars which had the transparent roof. By the way, they use the stock tires, brake pads and alignment settings but they do use the front brake cooling rings. We stayed in the condo's at the track which were really well designed, superbly furnished, spotlessly clean and decorated by someone who had great taste. We had a balcony on the rear of the room which looked out onto the track. The condo's are the most convenient place to stay and reasonably priced as they have a discounted rate for school participants. The locale in Pahrump, Nevada is right in the desert as you would expect and seems pretty sparsely populated. For places to eat we tried Symphony at the local winery which was a really good higher end restaurant and the local casino also has a good restaurant as well as a café. The Clubhouse at the track serves breakfast ($8 which is very reasonable), lunch (included for the students and $15 for others) and, on at least two nights (Monday and Tuesday), they also serve dinner. All their meals were good and reasonably priced. The weather was great even at 95-97 degrees since there was always a strong breeze blowing. They have plenty of shaded areas and Barb found the tower to be cool and offer great views. She took many of the pictures from that tower - a total of 149 pictures but unfortunately many were of the barren desert as she seemed to miss the cars speeding by………. While we were out there we added two extra days after the school to visit Red Rock Canyon, the Hoover Dam, the Las Vegas Motor Speedway and tour downtown Las Vegas which made it a great experience with a little local scenery thrown in. It was certainly an experience well worth the time and expense. We would highly recommend their school to anyone looking for a great experience. jsvette, MYKZDRM, Lipstic and 18 others like this. Thanks very much Rich for the details! I can't wait to do this! Thanks for sharing your experience. Was there any mention of oil ingestion or coking? During the classroom we had a chance to ask questions about the car but I don't recall any relating to ingestion or coking. I did ask about other things such as whether or not they used all the stock components and settings for track use. The school director said they use the stock brake pads, tires and alignment settings and that they do install the front brake cooling rings. I also asked about their break-in procedure and they advised that the follow the book and won't take the cars on the track until they have at least 1,500 miles on them. I didn't think to ask about any oil related issues but doubt the cars have enough miles on them to determine if coking is an issue. I had wanted to find a time when we could speak with the mechanics maintaining the cars to ask them a few questions but they were gone by the time our sessions concluded. Good stuff, thanks for the write up! Great report. Many thanks. I don't know how long the discount will last (or lasted) but I'd like to do this with one of the 6 speeds they have on order. Thanks again. The discounts are for C7 buyers and remain in effect for up to 1 year from date of delivery to the original purchaser. When you register with Spring Mountain, you have to give them your VIN and they verfiy the original purchaser of that car. I hear they will continue this program for the 2015 MY. 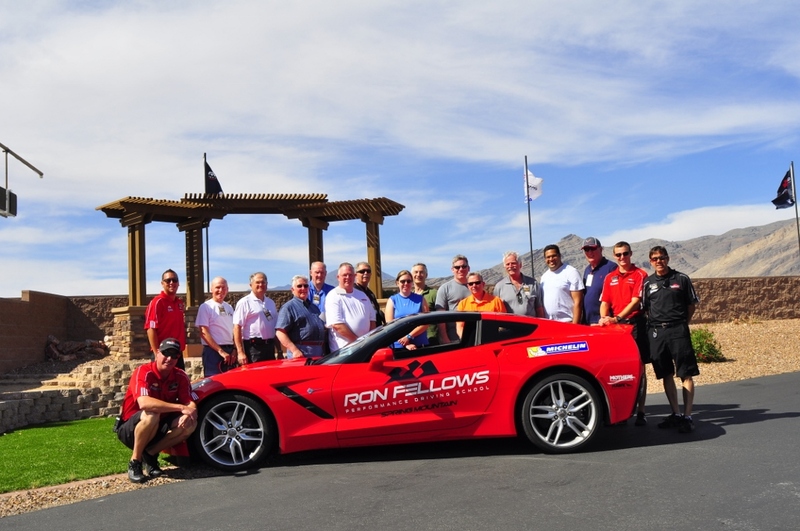 Summary: Highly recommend Ron Fellows Performance Driving School Stingray 2 day course. My impressions: It is much more driving than you anticipate. It is run by Rick Malone, who is genuinely interested in your getting the most you can out of the sessions. You are led by highly capable instructors with superb interaction and instructional skills. It goes quickly but is intense for the most part (I lost 2 ½ pounds in the 2 days and I was eating well, drinking plenty of fluids, etc.). You will easily be pushed to your limits in a friendly and non-pressure manner. You ultimately determine in almost all of the driving how far you want to push yourself. -The Stingrays are darn near bullet proof (the instructors’ words by the way). The cars are at times brutally driven, driven very very hard, pushed, etc. and yet they have had no problems. They specifically have had no oil ingestion issues- I asked two different times. They have now somewhere in the vicinity of 150 to 200 Stingrays there. -Until you take a course like this you have (or at least I had) absolutely no real idea as to how capable this Stingrays are in terms of sticking through the turns, stopping and high speed maneuvering. They consistently pushed (encouraged is a better word) you to go faster through the slaloms, curves and ‘ses.’ We- the participants- pretty consistently eased back at some point but not because the Stingray couldn’t handle it. -You take away a lot of great skills that cross apply to everyday defensive driving, such as how to properly use ABS and steer while doing it exactly where you want to go; how to really scan the road ahead; how to brake to drop speed versus ‘trail’ brake to shift the weight distribution; when to shift up/down; proper ball-roll (aka what we used to know as heel-tow) blipping on downshifts. -I did all of my track driving in with the manual except for one run where I drove their automatic. The manual, while the clutch required a bit more pressure than my Porsche’s, was exceptionally good. In all of the driving I only missed a shift once. After demonstrating that I could do the proper ball-roll technique I used the rev match which is truly amazing. -The condos you stay in are extremely nice and well equipped: full refrig, microway, small 2 burner stove, dishwasher, etc. -Two in our group had their wives who are invited by the instructors to participate in every session except one, as a ride along in their car. From what I could see they were made to feel very welcome. 2nd day: Almost all track. Started with ball-roll emphasis in a lead follow, faster speeds and emphasis on hitting the apex, brake and trail brake exercises, throttle steer and a 1:1 ride along. During the ride along they said they were only driving at about 50% with in most cases was at least 2 to 3 times faster than we ever drove! The last session in the class room went into the different mode setting and what they did, also discussed briefly the differences between the auto and manual Z51s and base models. The class room time was relatively short in between the tract times (and if nothing else gave you a chance to recover). Had a great time with the other participants including Area 473, razrx, Chipking and jagamajajaran. Jag was kind enough to take a couple of Go Pro MP4s of me that I will post at some point. Tom0021, VetteGirl, jagamajajaran and 6 others like this. I specifically asked at two different occasions and the reply was no ingestion issues, these C7s are pretty much bullet proof. For the ingestion issue with coking on the valves, I wonder if they have ever actually taken one apart to see. For the oil overfilled and showing up in the air box issue, this they should definitely know (since they should have a visible oil leak if they get too much in their air box). So, I would assume from their response to you that this has not occurred for them. Do you happen to know at what oil levels they keep in their Z51s? No I don't know what level they maintain the oil at in their Z51 Stingrays. All I know is what I reported Rodney. I specifically asked and they said they have not had any oil injection issues. They stay right on top of these cars with any maintenance concerns. I'd like to keep this thread pretty much focused on post Ron Fellows discussions. Let's move any further oil ingestion comments to the other existing threads. Thank you. Last edited by jsvette; 06-12-2014 at 06:28 PM. An amazing experience and 1st class all the way. Here's the June 4-6 class.